Snow covered mountain tops. Tranquil Japanese gardens. Sketches of both American and Japanese countrysides filled with careful, precise details. 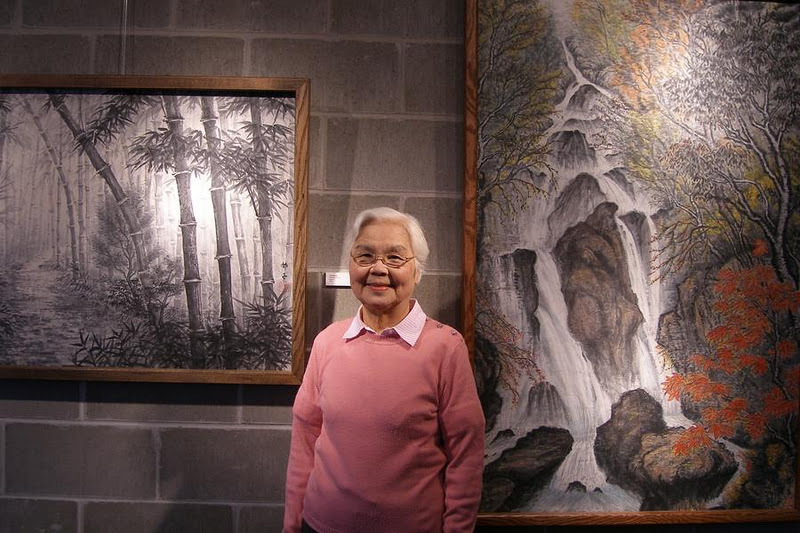 Such scenes can be viewed at the Ylvisaker Fine Arts Center Gallery on the Bethany Lutheran College campus where Ikuko Poetter’s work is now on display. Poetter’s grandson, Jason Jasperson, was instrumental in getting his grandmother’s work exhibited. “I grew up seeing her paintings on the walls of my house and in her house,” Jasperson recalls. “I thought they deserved a bigger audience.” Jasperson worked closely with his grandmother as the exhibit came together and as a consequence had the chance to get to know more about her life and also to get to know her better. While growing up in Niigata, Japan, Poetter was the only daughter of a successful businessman. Raised in the traditional Japanese Shinto faith, Poetter shocked her family when she began attending and then was baptized at a Lutheran church in 1951. She shocked them even further when she began dating a young missionary from Fond Du Lac, Wis., named Richard Poetter. Poetter remembers that it took a while for her family to become used to “Poetter-san” as they called him, but eventually her mother and siblings came to accept her choice. After a while, her father also gave his blessing and the two were married in 1953. The couple then began their work as missionaries in Japan. Along the way, they had three children, Hilda, Chris and Timothy. As the Poetter family grew up, they spent the three-month furloughs granted to missionaries every three years traveling to America where Poetter and her children became familiar with the American culture and language. The children spent their eighth-grade years with host families in the United States and later attended synodical prep schools for their high school educations so that they could secure their American citizenship while receiving a Christian education. Since the Poetters planned to move to the United States permanently upon their retirement, Poetter became a United States citizen, herself, in 1964. After studying sumie for a year, Poetter’s teacher encouraged her to enter the Nihon Nanga In Ten exhibit, an annual artists event held in Tokyo. Poetter traveled to Tokyo with her painting and was thrilled when her entry was accepted by a group of twenty judges to be in the amateur category. Between 1981 and 1990 Poetter was accepted into the exhibit a total of nine times and placed into the second tier three times. During the same years she also took part in several regional and city shows in Japan. Throughout the 1980s, Poetter chose to focus on painting scenes that depicted traditional rural Japan. Aware of the fact that Westernization was slowly but surely replacing ancient methods of farming and building throughout the country, she wanted to record through her work a past that seemed to her to be vanishing. In 1991, Poetter and her husband moved from Japan to New Ulm where their oldest daughter and her family lived. During that transitional period, Poetter continued to paint traditional Japanese scenes. Putting on paper what she remembered from her homeland helped her connect with what she’d left behind as she got used to her new life in America. She also began painting the flowers and rural scenes that she found in and around New Ulm.